For best advertising of your business or website, try and use many of these 57 free business marketing techniques below. These ways to advertise your website for free, working directly on your website, are about optimizing your site for Search Engines like Google, so that it can be more easily found in natural (free) search results – perhaps even on page one of Google search results! Get a website – even a totally free one that doesn’t even need domain registration and hosting. include some sub-headings in your article (that contain words or a phrase that relates to the rest of the content on the page, and that has search volume – use an h2 tag before and after your sub-headings if you can. These ways to advertise your website for free relate to leaving links on other sites, or at least your website address if some sites don’t allow hyperlinks or links. When people click those links on the other sites, they visit your website, or if they see the website address and the other information that you include with the website address interests them enough, they may still visit your site anyway. If you don’t have a website to link to, then what you can leave on other sites are your contact details like a telephone number, or an email address, or if you don’t want to display your phone number or email address publicly online for security reasons or privacy reasons, you can log into certain places from time to time to check your messages – or you may even be alerted via email when there are messages for you to go and read. Or perhaps you can link to your Facebook page or profile if you have a Facebook profile or page. Post ads on free classifieds sites. South Africans may want to consider using and including Vottle, Gumtree, Hotfrog, and OLX in their list of free classifieds sites. Try and write a unique ad for each of the free classifieds sites, of a decent length. Include some photos if allowed. 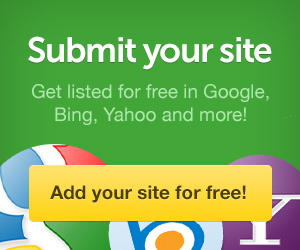 Post ads on free business directories. List your business for free. South Africans may want to consider using and including Yalwa and SA Web in their list of free business directories. Once again, try and write a unique ad of decent length for each of the free business directories you list your business or website in, and include some photos if the business directory allows you to. Share your best photos on sites like RedBubble or Flickr and link to your website from your profile, and even from the description area of each photo if it is allowed. Join Pinterest and inbetween pinning or repinning photos you like, pin a few of your own (that are also on your website) and include a link to that website page in your description beneath your pin. Also include a link to your website on your profile page on Pinterest. Join free online writing sites like HubPages, write and publish unique and good articles on HubPages and include a link in those articles to a specific page on your site that has related content. Also include a link to your website on your HubPages profile page. If your business is that you sell products or a product, include your website address or contact details on the products, or at least on the packaging. Ask your flea market or craft market friends (who have products at least slightly related to your products or services) to display your website address or contact details at their flea market or craft market stand in return for a free product or free service of yours. Display your business name and website address in large letters on your shopping bag, so that even when you go shopping in clothes that do not display your website address, your bag could make a great conversation opener while waiting in a long boring queue. There you have it – 57 ways to advertise your business for free – if you can use many or all of these free business marketing techniques, that’s a lot of free advertising. Hopefully this list will have given you even more free advertising ideas. It can be tough starting a new business or trying to get more customers or clients for your existing business. Even if you have a really good product or offer and deliver a really good service, that is all of no use to you unless many people know about your products or services. You need to advertise. So, if you have the time, why not advertise for free? If you do want to spend a little money rather than spend time doing all your business advertising yourself, we do offer a few website help services that you may be interested in. Even though you do not need a website to advertise your business online for free, when thinking of ways to advertise your business for free, and while learning how to advertise your business for free, you may discover that it may be a good business advertising idea to actually get a website, even a free website. Although one way to advertise your business for free would be by getting a free website like a free Blogger blog ( sites or blogs that have an address ending in blogspot.com ) through your free Google account, we recommend getting your very own website right from the start. If you just pay for domain registration and website hosting, you could install WordPress and then upload a free WordPress theme from over 1 500 to choose from at wordpress.org – then add your own writing and images – although it may take some getting used to, to add your own content, if you can get around Facebook easily, and have a little time and patience, and learn as you go along, you should manage – you don’t need to know how to design a website to add your own writing and images to a WordPress-powered site of your own, that you’ve added a free WordPress theme to. If you do feel that you’d rather have a bit of help, we have a variety of website packages that may suit you. 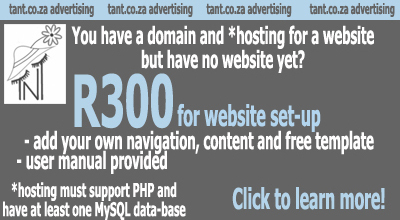 If you already have a domain registered and already have hosting for your site, the least expensive of our website packages would cost you R300.